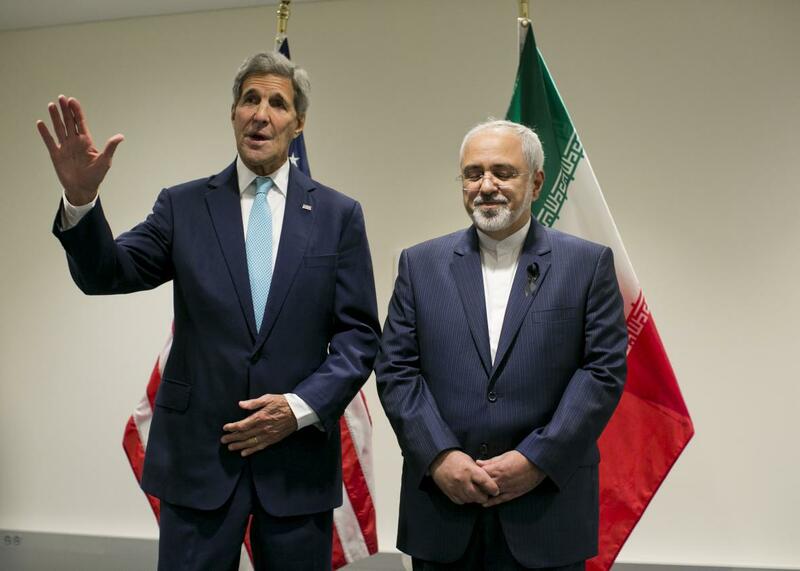 Iran invited to Syria talks with Russia, U.S.
United States Secretary of State John Kerry poses with Foreign Affairs Minister of Iran Javad Zarif during a bilateral talk at the United Nations headquarters on September 26, 2015. Iran has been invited for the first time to international negotiations over Syria, due to convene on Thursday in Vienna. The invitation was extended by Russia, which like Iran is a backer of Bashar al-Assad’s regime, but was agreed to by the United States. U.S. Secretary of State John Kerry and Russian Foreign Minister Sergei Lavrov will be at the meeting along with several other top European and Arab diplomats. Whether Iranian Foreign Minister Javad Zarif or another senior Iranian official will make the trip, is far from certain. This would be the first major opportunity for U.S.-Iranian cooperation following the recently concluded nuclear agreement, but Supreme Leader Ayatollah Ali Khamenei has forbidden any further negotiations between the two countries. Still, as was demonstrated repeatedly during the nuclear talks, there’s usually some wiggle room in Khamenei’s pronouncements. The U.S. and Iran are both dedicated to destroying ISIS and are both assisting the Iraqi government, but things are more complicated on the Syrian side of the border. Iran and Russia are likely to reject a political settlement that involves removing Assad from power. The U.S. still maintains that Assad should step down, although more recently the Obama administration has suggested it may be willing to accept a temporary transitional role for the embattled Syrian leader. Along with Russia, Iran has recently stepped up its involvement in the conflict, contributing hundreds of troops to fight alongside regime forces and Hezbollah fighters against rebels in Northern and Western Syria. The forces have reportedly suffered heavy casualties, including the recent deaths of two senior commanders in the Revolutionary Guards. Iran’s investment in the conflict has been much more substantial in both blood and treasure than the United States, and it certainly has an incentive to try to bring the war to an end. It potentially has the ability to put meaningful pressure on Assad. At the moment, it’s hard to imagine a settlement that would satisfy both Washington and Tehran, never mind Moscow, but it’s not as if sidelining Iran from the process has really accomplished much either. Republicans will undoubtedly accuse the administration of another capitulation to Iran, but at this point Obama doesn’t seem too concerned about that.